9ct white gold diamond and tanzanite crossover ring. The combination of vibrant tanzanite and sparkling white diamond compliment each other beautifully. 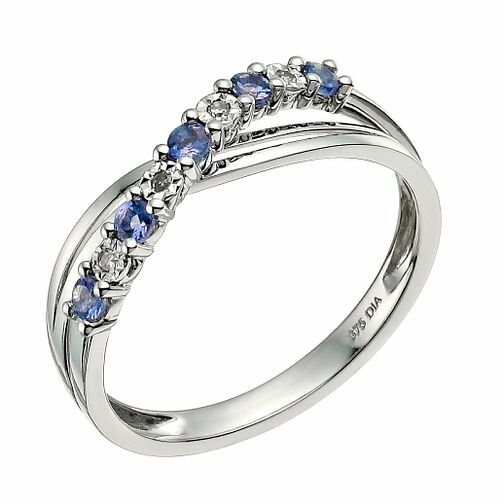 9ct White Gold Diamond & Tanzanite Crossover Ring is rated 4.3 out of 5 by 4. Rated 5 out of 5 by Anonymous from Stylish and pretty I bought this for myself as my daughter was born in December and my Son in April so contained both there birth stones. I have very slim fingers and it fits lovely between my wedding ring and engagement ring I have wore it everyday for nearly 3 years and it looks as crisp as ever with it only just starting to fade in colour on the back (to be expected with white gold as needs treating to keep the white gold finish) still love it as much as I did when I first got it. Rated 2 out of 5 by Anonymous from Colour is deceptive It is a pretty ring but I feel the picture is very deceptive. The ring arrived today for a very special birthday and it barley has any colour in the tanzanite. In the picture it looks a strong blue and in reality it is virtually silver with a slight hint of purple. I am disappointed with this ring and think the photo should be adjusted to show a true representation of the product.